Republic, 15 Chapters, 1941. Starring Frances Gifford, Tom Neal, Eddie Acuff, Gerald Mohr, Frank Lackteen, Trevor Bardette, Tommy Cook. Physician John Meredith (Trevor Bardette) has spent many years doctoring the isolated Masamba tribe, deep within the unexplored jungles of the Simbula region; his tireless work on the tribe’s behalf has not only earned him the position of the Masambas’ medicine-man, but the custodianship of their priceless cache of diamonds as well. Hoping to gain this cache, Meredith’s evil twin brother Bradley (Trevor Bardette) decoys his brother to the city of Kimbervaal, where Bradley’s ruthless partner “Slick” Latimer (Gerald Mohr) murders the good doctor; Bradley and Latimer then fly to the Masamba village of Kairobi, where Bradley passes himself off as his late twin to the natives. 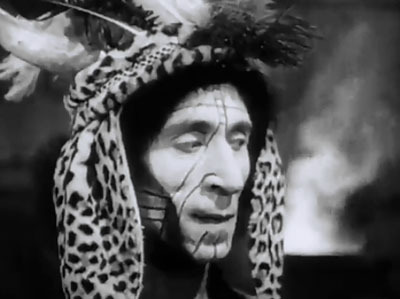 However, the two villains’ scheme to seize the diamonds is hampered by the equally villainous scheming of witch-doctor Shamba (Frank Lackteen), who was ousted from the medicine-man office by Dr. Meredith and is plotting to regain his power over the Masamba tribe; to accomplish this goal, he steals the Lion Amulet, the medicine-man’s badge of office–and, incidentally, the key to the hidden diamonds. 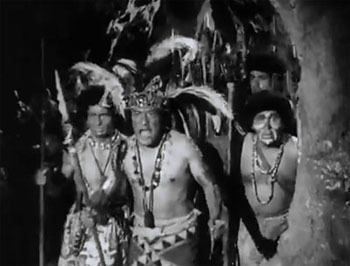 Dr. Meredith’s jungle-raised daughter Nyoka (Frances Gifford) tries to protect her father from the witch-doctor’s wrath, aided by pilots Jack Stanton (Tom Neal) and Curly Rogers (Eddie Acuff); however, the Jungle Girl and her aviator allies are unaware that the imposter Bradley has taken Dr. Meredith’s place, and that he and Latimer pose just as grave a threat as Shamba does. 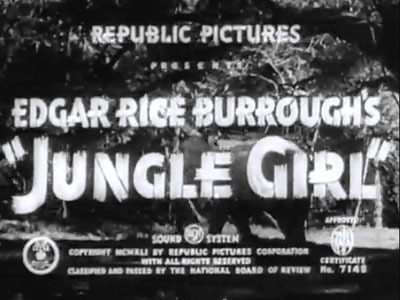 Republic Pictures’ marketing team sold Jungle Girl to exhibitors by emphasizing its revival of the popular silent-era “serial queen” concept, and by playing up its supposed roots in a book by Tarzan’s famous creator Edgar Rice Burroughs (see the Note at the end)–while the studio’s serial-making team packed so much entertainment value into it that it captured the imaginations of matinee audiences. It proved to be one of Republic’s biggest serial successes, and was followed within the next few years by both a quasi-sequel (Perils of Nyoka) and an unconnected but obviously imitative follow-up (The Tiger Woman). 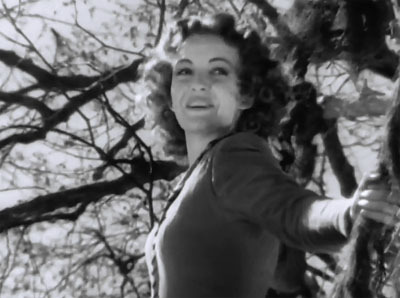 Above: Frances Gifford as Nyoka orders a halt to a native attack, from atop her pet elephant. Jungle Girl’s basic plot is rather thin, lacking as it does the sequential treasure-hunt aspect of other top-ranking Republic exotic-adventure serials like Drums of Fu Manchu, Adventures of Captain Marvel, or the above-mentioned Perils of Nyoka. The audience knows exactly where the diamonds are hidden from the first episode onwards, while the serial’s heroes and villains devote far more time to vying for control of the amulet (and, later, of the diamonds themselves) than they do in looking for the gems. However, writers Ronald Davidson, Norman Hall, William Lively, Joseph O’Donnell, Joseph Poland, and Alfred Batson manage to keep this potentially repetitious scenario interesting, and prevent it from devolving into a series of near-identical hero-villain duels over a MacGuffin; they accomplish this through a strategically spaced series of plot twists–most of which arise from the use of an unusually volatile collection of villains. As in Jungle Jim (which scripter Hall had worked on over at Universal), the presence of two distinct villainous factions, and the frequently shifting relationships between those factions and the heroes, makes the narrative feel refreshingly unpredictable throughout. The first six chapters of Jungle Girl center around Nyoka’s attempts to recover the amulet from Shamba, Shamba’s attempts to destroy her and her friends, Jack’s attempts to repair and fuel the plane in which he hopes to safely transport Nyoka and her “father” to Kimbervaal, and Latimer’s behind-the-scenes attempts to delay the planned escape flight until he and Bradley can grab the diamonds. This plot setup is shattered in Chapter Seven, just as the action is starting to seem repetitive; an unexpected rebellion by Latimer’s henchman Ted Bone, and Bone’s subsequent murder by his boss, triggers an investigation by Jack and Nyoka that leads directly to an exposure of Latimer’s treachery in Chapters Nine and Ten. The diamond-theft plot also comes to the fore around the same time, with Latimer gaining control of the amulet and making a deal with Shamba to swap it for the gems–only to be frustrated when Nyoka and Stanton get ahold of the diamonds first. The remaining episodes then deal with the good guys’ efforts to fly themselves and the diamonds out of Latimer’s reach, while the latter and his henchmen go all-out to prevent their escape; this protracted concluding conflict is accompanied by additional plotting turns–including the unmasking of Bradley and his eventual attempt to double-cross Latimer–that help the storyline remain fresh right through the fifteenth chapter. 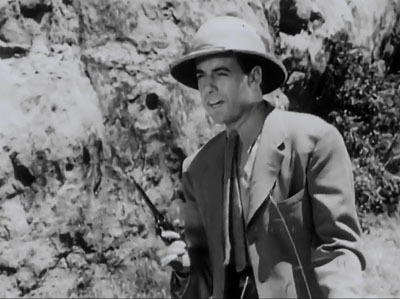 Above: Gerald Mohr as Latimer prepares to destroy the disguised blow-gun he’s just used as a murder weapon, hoping to cover his tracks. 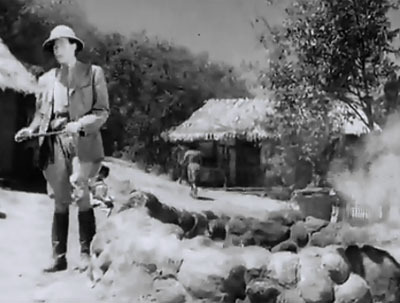 Jungle Girl’s writers not only do a deft job of stretching out their storyline, but also manage to subject their protagonists to a consistently imaginative and varied series of dangers; these hazards are vividly and expertly brought to life on screen by directors William Witney and John English and their production team. 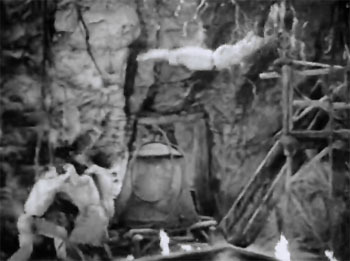 The serial’s massive main interior set, the Masambas’ sacred Caves of Nacros, serves as a particularly impressive source of perilous adventure; the caverns are equipped with a self-flooding mechanism, a giant sacrificial altar that feeds victims into a furnace, a dungeon that fills with poison gas, a receding floor positioned above a bottomless pit, and a primitive ore-crushing device–all of which figure prominently in memorable, skillfully edited, and suspensefully shot cliffhanger sequences (the conclusions of Chapters One, Two, Five, Nine, and Eleven, respectively). 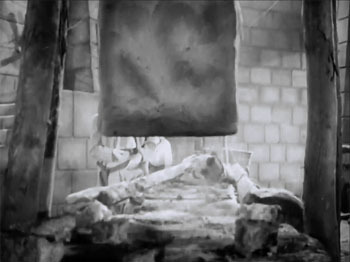 Above, top left: Frances Gifford (doubled by Helen Thurston) is lifted towards the flaming “mouth” of the Lion Goddess at the end of Chapter One. 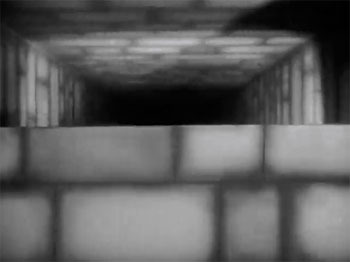 Top right: Deadly gas pours into the dungeon at the end of Chapter Five, passing over the grisly remains of a previous dungeon occupant. Bottom left: The floor pulls back to reveal a bottomless pit at the end of Chapter Nine. Bottom right: Tom Neal heads towards the ore-crushing block at the end of Chapter Eleven. The cliffhanger sequences that occur outside the Caves of Nacros are equally memorable, inventive, and well-done; standouts include Nyoka’s fall from a log “bridge” that spans a dangerous crevasse in Chapter Seven, her fall into an impromptu oil-refining vat in Chapter Eight, and her endangerment by a rampaging gorilla in Chapter Ten–a sequence that is so effectively and dramatically filmed that it comes off as strikingly tense and even scary, despite the fact that the threat involved is a typically fake-looking serial ape (played by Emil Van Horn). 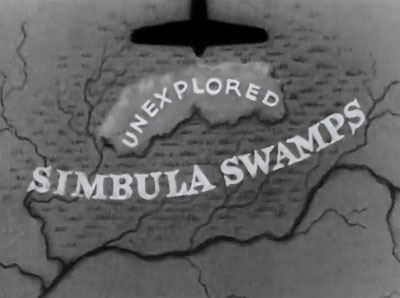 The Chapter Fourteen spear-trap cliffhanger is first-rate as well, as is the visually spectacular ending to Chapter Three–which has Nyoka, Jack, and Curly trapped in a blazing oil swamp after an exciting and well-shot torchlight chase (this sequence also serves as a clever means of introducing a plot point–the existence of crude oil in the Simbula swamps–that becomes pivotal in later episodes, when Jack loses his airplane’s gas supply and is forced to try and make his own fuel). 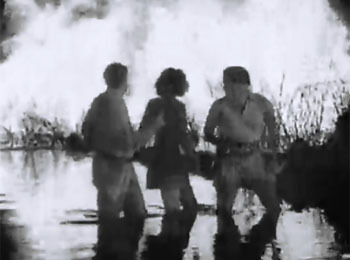 Above left: Eddie Acuff, Frances Gifford, and Tom Neal trapped in the swamp fire at the end of Chapter Three. 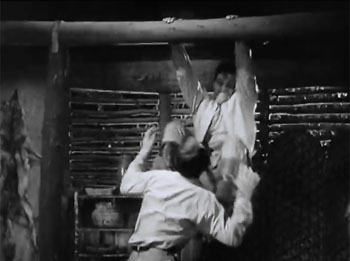 Above right: The gorilla starts smashing down a hut door to get at the helpless Frances Gifford, at the end of Chapter Ten. Jungle Girl’s imaginative action sequences are by no means confined to its cliffhanger scenes. For example, the writers and directors give us no fewer than three fights with lions in different episodes, but put a new spin on the action each time, and make each sequence more exciting than the one before it. 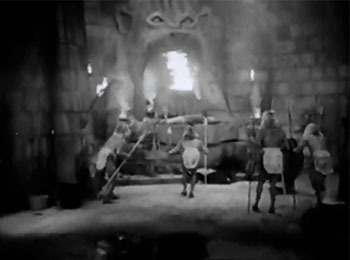 Frances Gifford’s ritual knife-against-claw battle with a lion inside the Nacros caves in Chapter Two–a well-shot and well-staged sequence–is followed by an even more interestingly-filmed Chapter Four scene that has an unarmed Tom Neal and Eddie Acuff trying to fight off a lion with sticks inside a pit-trap; the frequent overhead shots that show the narrow dimensions of the pit effectively emphasize their plight. 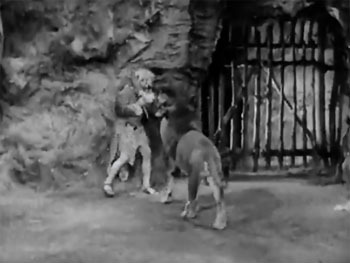 The third lion encounter is the best of all–the Chapter Eight sequence that has Tom Neal getting caught in a snare and hanging by one foot from a tree as a lion leaps at him; the point-of-view shots of the knife-wielding Neal stabbing downwards at his feline assailant, and of the lion lunging upwards towards his prey, make the scene vividly exciting. Animal trainer Melvin Koontz doubles both Gifford (who conveniently wears a face-concealing headdress during her lion fight) and Neal whenever they interact directly with the lion (Koontz’s dependable cat Jackie) in these sequences; Acuff’s double could either have been a Republic stuntman (he keeps further away from the lion than Koontz does during the pit scene) or an assistant of Koontz’s. 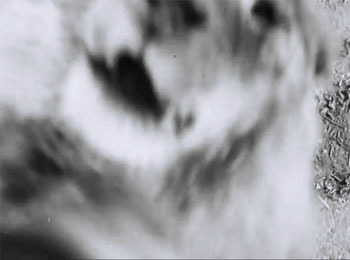 Above, top left: A shot from the Chapter Two lion fight. Top right: The fight with the lion in the pit. Bottom left and right: Tom Neal and Jackie lunge at the camera during the Chapter Eight lion scene. Frances Gifford’s grapple with a supposed crocodile (an alligator in stock-footage shots, and a rubber dummy in the actual combat) is, like most such low-budget reptile fights, not particularly energetic or convincing. However, the sequence is set up in terrifically suspenseful style, with the good guys crossing a crocodile-infested stream one by one, unaware that the narrow bridge on which they’re treading is weakening with every step they take. The Chapter Eleven gorge-crossing sequence–which involves a primitive cable-car, and concludes with Gifford sliding to safety on a pulley after the car falls–is also excellent. Dave Sharpe doubles Gifford for the pulley slide, for her head-first fall off her pet elephant in Chapter Fourteen, and in a few other bits of action, but stuntwoman Helen Thurston (like Sharpe, a former gymnast) stands in for her during other elephant rides and in the serial’s innumerable vine-swinging scenes. 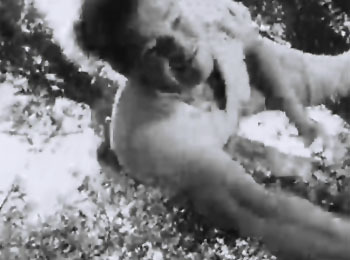 Authorities differ as to whether Thurston or Sharpe performed the trapeze-artist-style flips during the vine sequences, some crediting it to the former, some to the latter. Thurston can be seen doing many of the treetop landings and at least some of the transfers during these scenes, but it’s much harder to tell who is doing the impressive mid-air somersaulting. 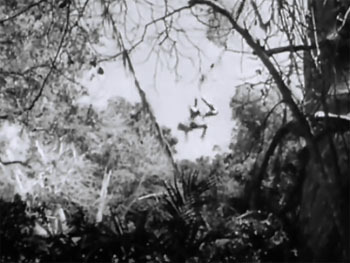 Above: Helen Thurston (or Dave Sharpe) transfers from vine to vine (left); Thurston makes a landing in a tree (right). Sharpe, a gymnast himself, turns in similarly impressive work as Tom Neal’s double in several wonderfully acrobatic fight scenes; one of the best of these is the extended Chapter Eight battle with Shamba’s men in the oil-refining cave in Chapter Eight, which has Sharpe and Duke Taylor (doubling Eddie Acuff) taking on adversaries that include Duke Green, Jimmy Fawcett, and Ken Terrell. 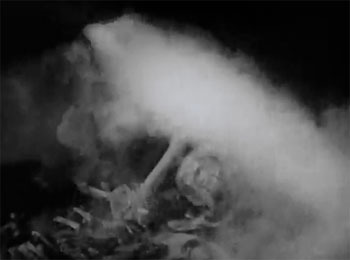 The fight between Sharpe, Terrell (doubling Trevor Bardette) and Tom Steele (doubling Gerald Mohr) in Latimer’s hut in Chapter Thirteen is also dynamic and exhilarating, as is the fight between Steele and Taylor (doubling Mohr and Acuff again) in the ore-crushing chamber in Chapter Twelve. Though there are many other fights of varying duration (and uniform excellence) spread throughout the serial, whole chapters sometimes pass without one–allowing space for other types of action, and allowing the really big fight set-pieces to stand out more than in many later Republic serials. Above left: Dave Sharpe makes a flying leap to join the fray in Chapter Eight. Above right: Sharpe kicks Tom Steele in the face during the fight in Chapter Thirteen. Yet more action highlights include the well-staged spear/gun battles between the good guys and Shamba’s men in Chapters Five and Nine, the nighttime native attack on the plane in Chapter Thirteen (which has Nyoka and Curly routing their enemies with flare-guns), and the breathtaking climactic action sequence in Chapter Fifteen–during which Sharpe, doubling Tom Neal, drops beneath an approaching airplane, seizes its undercarriage, and is lifted into the air. Directors Witney and English, cinematographer Reggie Lanning, and editors William Thompson and Edward Todd handle the serial’s less active sequences with equal flair; the murder of Dr. Meredith in Chapter One (tightly and eerily intercut with scenes of Shamba preparing “death voodoo” for Meredith) and the dramatic Chapter Twelve scene in which Nyoka finally realizes her father’s being impersonated (carried off with almost no dialogue) are both exemplary instances of film-making. 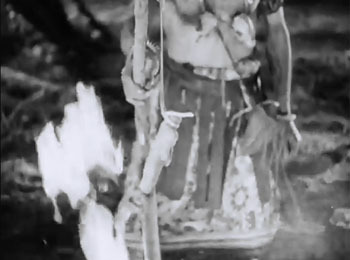 Above left: Frank Lackteen as Shamba holds a voodoo effigy of Dr. Meredith over a fire. Above right: Frances Gifford’s Nyoka has just found conclusive evidence that her seeming father is an impostor. 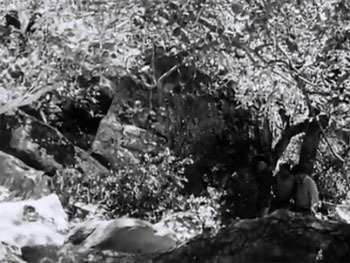 Though Jungle Girl’s extensive outdoor scenes make heavy use of familiar Southern California locations like Corriganville, Iverson’s Ranch, Lake Sherwood, its lakeside cliff, and nearby Sherwood Forest, Witney, English, and the rest of the serial’s production crew are able to keep the serial’s settings looking reasonably “African.” They take care to film most of the Corriganville and Iverson scenes in those ranches’ more thickly-forested or more veldt-like sections–save for the periodic scenes on the rocky slopes that supposedly overhang the rear entrance to the Nacros caves, and the similar cliffs that feature in the cable-car scene. 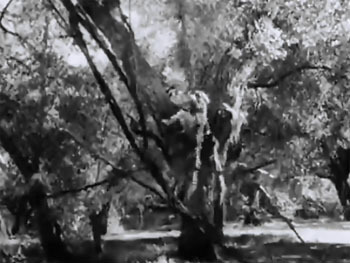 The behind-camera crew also takes maximum visual advantage of Sherwood’s tall and overhanging trees, which give a properly wild and wooded look to many scenes. The outdoor native villages are sprawling and convincing, and the hut interiors well-appointed, while (as mentioned) the Nacros temple/cave interiors are excellent. The vaguely Egyptian look of some of these interiors (particularly the diamond room) is adequately accounted for by a brief piece of dialogue that explains that the Masambas’ ancestors originally trekked south from North Africa; the same dialogue also serves as an explanation for the natives’ basically Caucasian appearance. Above left: Frances Gifford, Tom Neal, and Eddie Acuff cautiously advance through a stretch of “jungle” at Corriganville. 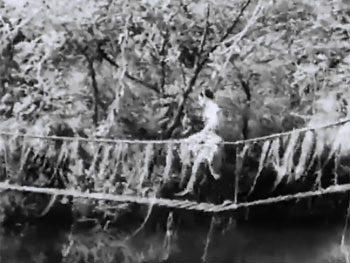 Above right: Neal crosses a bridge in Sherwood Forest. 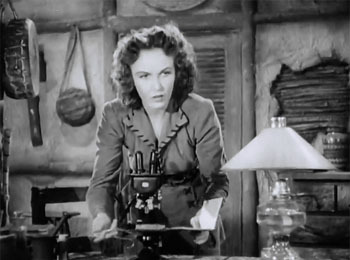 Unlike many Republic serials, Jungle Girl features a flawless cast; its major and minor players are all either first-class feature-film actors or experienced serial veterans. Graceful and gorgeous leading lady Frances Gifford, who was loaned from Paramount to Republic, falls into the former category. One of the best and most charming actresses ever to appear in a Republic chapterplay, she adopts an assured and matter-of-fact attitude towards animal and native dangers that makes her character’s supposed jungle upbringing seem credible, but varies this assurance with convincing displays of alarm, urgent concern, or sorrow when appropriate (her reaction to her discovery of her father’s death is outstanding). She’s also delightfully cheerful and good-natured in lighter moments (like her amusedly patient interchanges with native boy Kimbu), and is so appealing overall that the viewer finds it very easy to get involved in her character’s dangerous adventures. Former MGM contract player Tom Neal brings plenty of personality to the Jack Stanton role, snapping out orders with tough authoritativeness but also giving his character a breezy, jaunty, and almost flippant air that seems very fitting for the daredevil bush-pilot that he’s supposed to be; his impressive college-boxing-champ’s physique and his clipped moustache complement his screen personality, and help to make him come off as a classic all-round adventurer. He’s particularly good when he’s defiantly wisecracking in the face of imminent death in Chapter Eleven, and when he’s gruffly and determinedly rallying the Masamba warriors to battle in the final episode. The likable Eddie Acuff has the best of his serial sidekick roles as Curly Rogers, and provides welcome humor without hampering the action in the slightest. Though he grumbles about dangers and inconveniences, and tosses off jokes in entertaining fashion (his deadpan quipping in the lion-pit scene–which draws a funny grimace from Neal–is especially enjoyable), he’s also given plenty of straightforwardly heroic moments (like his decision to give himself up to angry natives to save others in Chapter Six), and handles them with an easygoing determination that’s both credible and compelling. 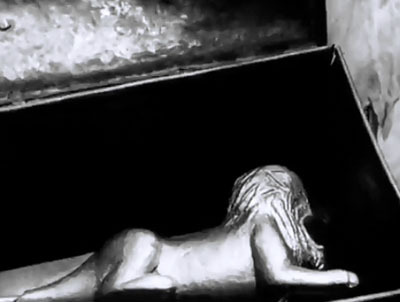 Above: Eddie Acuff drolly waits for an answer after knocking on a mummy case. 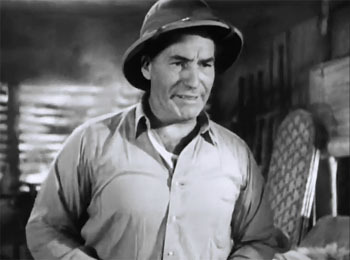 Gerald Mohr, a stage actor who would go on to a long career as a radio star and a film and television heavy, delivers an excellent performance as Slick Latimer, one of the more underrated villains in the Republic canon but one of the most effective; his relaxed but cunningly alert demeanor when parleying with Shamba or parrying the good guys’ questions, combined with the curt swiftness with which he takes action when he has to, gives him a decidedly serpentine aura. His fine speaking voice–at once smooth and harsh–adds to his menace, as does the chillingly casual smirk he invariably flashes before murdering someone. 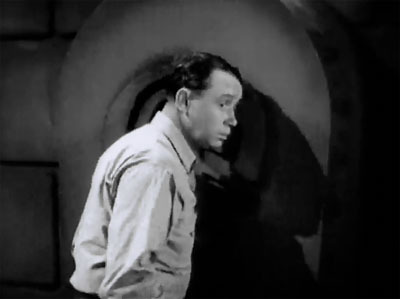 As Bradley Meredith, Trevor Bardette starts out acting as smooth and collected as Mohr, but then becomes increasingly nervous and panicky as the serial progresses and his initial plan starts going awry; his feverish fretfulness contrasts ideally with Mohr’s unflappable cool, while his subtle, furtively thoughtful facial expressions when telling lies for Nyoka’s benefit or (later on) planning to double-cross his partner help him to steal many scenes. Bardette is just as good in his much shorter turn as the kindly but quietly authoritative Dr. Meredith, particularly when he reacts to the news that his criminal brother supposedly needs his help. Silent-serial veteran Frank Lackteen pulls off the role of Shamba as few other serial actors could have. Completely unselfconscious in the character’s odd and potentially silly-looking costume and makeup, he uses the emphatic physical acting style he developed during the silent era to give his witch-doctor a strong and sinister screen presence–conveying dignified grimness with his every move, and wordlessly but dramatically registering sinister craftiness (when making deals with other villains) and bitter vindictiveness (when he’s about to rid himself of his enemies). Even the thick accent that limited his sound-era roles plays to his advantage here, since it makes Shamba immediately seem alien and exotic in a way that an American character actor spouting broken-English dialogue couldn’t have matched. Tommy Cook, as Nyoka’s young native friend Kimbu, basically reprises his “Little Beaver” role from Adventures of Red Ryder. His character is again little Mr. Eyewitness, always happening on the scene just as the villains are trying to perform some skullduggery undetected, and then rushing off to report to the heroes; comically predictable as Kimbu’s actions become, they do make him seem likably helpful, instead of useless and pesky. 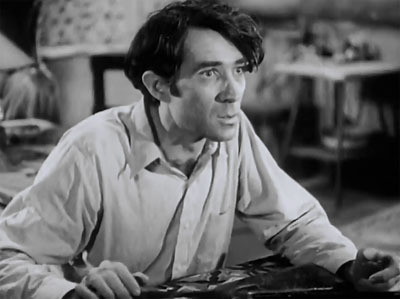 Cook’s cheerfully enthusiastic performance in the role is also likable, and he appears to have a good rapport with both Gifford and Neal; his farewell to Gifford in the final chapter is actually rather affecting. 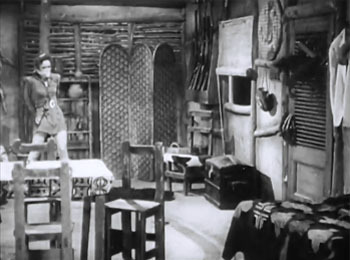 Professor, the same capuchin monkey who played Billy Benedict’s pet Jitters in Perils of Nyoka, is Cook’s simian pal Keeta here–and, like Cook, figures in the action instead of just acting cute; the Chapter Fourteen sequence in which Cook sends him into Latimer’s hut to purloin medical supplies under the villains’ noses is memorably and tautly suspenseful. Above: Tommy Cook, up to his usual spying tricks. Latimer’s trio of henchmen is composed of three very solid heavies. 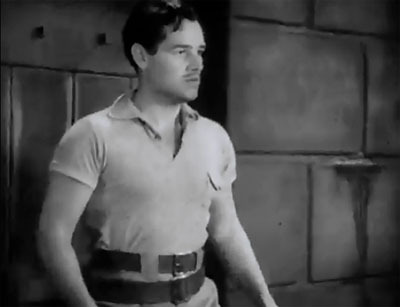 Stocky, raspy-voiced Joe McGuinn has the least screen time but the most unusual role as the belligerent Ted Bone; his angry refusal to let Eddie Acuff’s character to be unjustly sacrificed to appease the angry natives, and his stubborn determination to defy Latimer after the latter tries to kill him, make him ultimately seem rather admirable. Bud Geary, who functions as Latimer’s chief thug, plays his largely background role with his usual hard-boiled humorousness and laid-back swagger, and makes the most of his occasional dialogue scenes. Rangy Al Taylor has little to do but back up Geary, but his cagily tough demeanor and colorfully scruffy appearance prevent him from being completely obscured by that expert scene-stealer. Above left: Joe McGuinn registers a forceful protest. 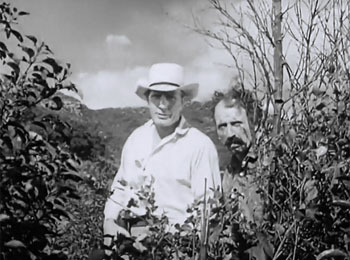 Above right: Bud Geary (white hat) and Al Taylor wait in ambush. 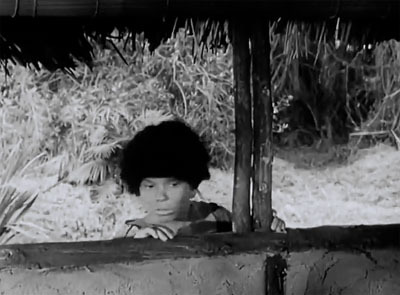 Veteran villain Robert Barron (almost unrecognizable at first without his usual moustache), plays Shamba’s chief henchman Bombo; he can’t help looking a bit absurd in a sarong and a fuzzy wig, but is wisely not given too much dialogue, and does do a fine job of glowering menacingly in support of Frank Lackteen. Hawaiian actor Al Kikume is quite good (stoically dignified and ferociously energetic by turns) as the Masamba chief Lutembi, Ken Terrell plays his stern right-hand man, and the imposingly muscular Jerry Frank is the chief of the “Lion Men”–the picked Masamba warriors who guard the caves of Nacros, and are bound to obey the holder of the coveted amulet. 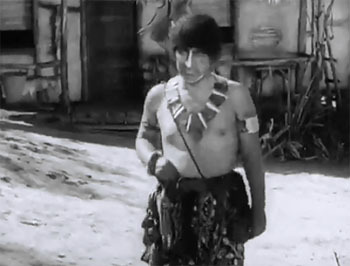 Jay Silverheels can be spotted as one of the subordinate Lion Men, while other minor natives are played by various stuntmen. Above left: Robert Barron has just managed to purloin a locket needed for Shamba’s voodoo ceremony. Above right: Al Kikume (center) orders his men to exit the caves of Nacros upon hearing a warning drum. 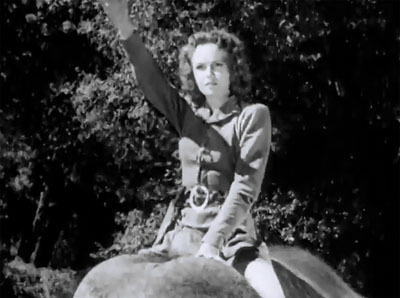 Cy Feuer’s main musical theme for Jungle Girl is not one of his most striking Republic pieces, largely because its measured, jungle-drumbeat central motif–though well-suited to the serial’s setting–isn’t as insistently energetic as the quicker-paced themes of serials like Red Ryder or King of the Royal Mounted. However, Feuer’s action-scene music for the serial is still quite lively, underscoring the sequences that it accompanies very well indeed. Jungle Girl ultimately provides another strong example of the talent and creativity of Republic’s chapterplay production crew during the studio’s Golden Age. Despite the handicaps of an attenuated storyline, and the inherent difficulties involved in making a convincing low-budget jungle saga, they (with the help of a superb cast) turned out an handsomely-produced, engrossing, and highly entertaining chapterplay–one that’s filled from start to finish with a delightful atmosphere of unpredictable adventurousness. A Note on the Source: Edgar Rice Burroughs’ novel Jungle Girl (originally serialized in magazine format as The Land of Missing Men) had absolutely nothing in common with this serial “adaptation” save its title. Burroughs’ book was set in a Cambodian lost city, and its titular character was a princess named Fou-tan; Republic only bought the rights to the novel so they could put the valuable Burroughs imprimatur on their jungle heroine, and thus connect her firmly to Burroughs’ famed jungle hero Tarzan. This entry was tagged Bud Geary, Eddie Acuff, Frank Lackteen, John English, Republic serials, Tom Neal, William Witney. Bookmark the permalink. Aces all the way!! !Five big stars! Towards the end of Chapter 2, Tom Neal hits Jay Silverheels (the man who played Tonto) in the head. Watch for it.